RIO GRANDE CITY — While furniture was still being loaded off an 18-wheeler and into new buildings at the South Texas College Starr County Campus, college officials, local leaders and students gathered to commemorate the completion of six construction projects intended to bring new programs and accommodate more students at the campus. The projects were part of the $159 million bond issue passed by voters in 2013, for which Starr County delivered the deciding votes for the tax increase after most Hidalgo County voters rejected the measure. The six construction projects at the Starr County Campus took more than $24 million to complete and included improvements to parking and landscape for about $3.5 million, a new Health Professions & Science Building at a cost of about $9.5 million, and expansion of the library for $3.7 million, student services building for $1.3 million, student activities building for about $1.4 million and thermal plant for about $4.7 million. Having a dedicated Health Professions and Science Building, where these four chemistry and biology labs will be located along with two nursing skills labs, four classrooms, five simulation labs, four computer labs and six study rooms, will allow the college to replicate some of the degree offerings for which some STC students must now drive to McAllen. 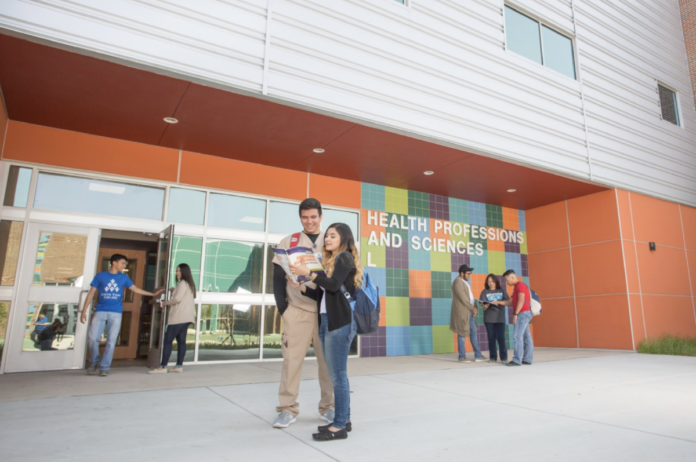 The Starr County campus is already offering the vocational nursing degree, said Jayson Valerio, dean of the STC nursing and allied health programs, but the plan is to start adding courses this fall that will eventually lead to other degrees such as the associate degree in nursing, emergency medical technology and occupational therapist. These are areas in which the college is trying to allocate more resources in order to cope with demand in the county, he said, as the demand is expected to continue to increase over the years. The new state-of-the-art library will be open to the public and now includes open study areas, quiet study rooms, and active study and multipurpose rooms. The additions to the other buildings include a new auditorium in the Student Activities Building with capacity for 308 people. The Student Services Building will get 22 computer stations, orientation rooms and a computer lab, space that Reed deemed as extremely needed. She expects the campus’s new thermal plant to save the college millions. “This was a big investment but it is in the long run going to save the college and the taxpayers millions of dollars because it will be the most efficient way to provide the college heating and cooling,” Reed said.